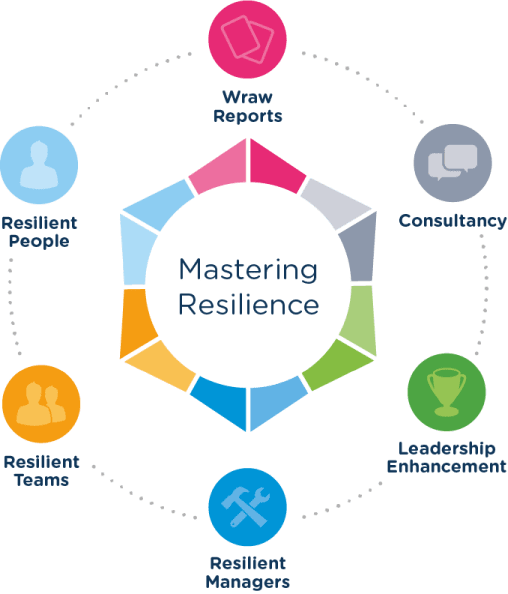 The Mastering Resilience Programme draws on an evidence-based and validated model of resilience. Practical learning solutions enable a joined up and robust framework to build healthy high performance within your organisation. There is something for everyone, select from outstanding coaching programmes, interactive training sessions, accessible and engaging webinars, toolkits and digital learning. Wraw offers you a broad selection of reports, with valuable insights into resilience and the impact on wellbeing. Reports are available in snapshot, individual, team, leaders, groups of leaders and the whole organisation. End-to-end consultancy to build a robust wellbeing strategy which results in real business impact. Drawing on: Leaders’ Summary Report and the Organisation Report. Inspire and enhance leadership behaviours to sponsor and role-model healthy high performance. Drawing on the Leader Report and the Leaders’ Summary Report. Build manager confidence to hold wellbeing conversations and nurture resilience thereby minimising the impact of workplace pressures. Drawing on the Leader Report. Educate, empower and inspire individuals to discover and maximise their own levels of resilience. Drawing on either the Snapshot or Individual Report. As many as 61% of employees have experienced mental health issues due to work or where work was a related factor. Business In The Community – Mental Health at Work 2018 report. 85% of managers acknowledge that employee wellbeing is their responsibility, but only 30% of managers report they have received any training. The benefits of organisations investing in health and wellbeing include better employee morale and engagement (44%), a healthier and more inclusive culture (35%), and lower sickness absence (31%).